We're proud to announce the 2nd Annual Total Customer Experience Leaders Summit 2012, taking place June 6-8, 2012 in Boston, MA. For 2012, the Total Customer Experience Leaders Summit is about breaking silos. It's about joining together diverse industry leaders to share genuine insights and best practices for designing an integrated experience with measurable impact. Download the conference brochure. No matter where the accountability of "customer value" lives in your organization, customer centricity is a real leadership issue and one that takes priority especially today. • And more! Download the brochure for the complete speaker line-up and full conference agenda. • Customer Experience Design: See how VOC data and design principles can be used to engineer experiences across your organization. • Measurement & Feedback: Drive change and optimize your sales force by measuring customer feedback through the entire customer experience. • Strategy: Interpret, analyze and evaluate your customer strategy to ensure business relevance. • Alignment: Integrate and leverage your customer touchpoints - measurement & ROI, linkage, VOC, technology, design principles, operational metrics, and senior leadership - to structure a successful and meaningful program. As a reader of our blog, we’d like to offer you a 15% off the standard registration rates, use code TCEL12BLOG to save. Register today. 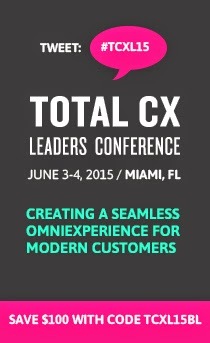 As we quickly gain on the next Total Customer Experience Leaders (TCEL) Summit in June, we'd like to occasionally share with you some of our favorite links of the week on customer experience, customer experience design, and overall customer-centricity. This week, Fast Company was a gold-mine of Customer Experience articles, providing this piece "User Experience The Don Draper Way," this blog on the false dichotomy between Culture and Strategy, "4 Elements That Make A Good User Experience Into Something Great" and this feature on Co.Design on "3 Ways To Predict What Consumers Want Before They Know It." Customer experiences happen for everyone throughout a company, and anyone can identify opportunities for "pinpointing problems customers can’t adequately solve." Elsewhere, this blog post by Pretium Solutions was shared in our LinkedIn group about the power of "I'm Sorry" and the emotion attached to customer experiences. Also on LinkedIn, I asked "What are your current biggest customer experience challenges?" join the group and vote on the poll here. What were your favorite customer experience links this week? Like these updates? Follow us on Twitter or Facebook for industry news throughout the week. This week there was one big "L" word on everyone's lips, and while love plays into it, that word was actually "Loyalty." I got emails urging me to vote for my favorite loyalty hotel program in the annual Freddie Awards and Valentine's Day inspired a number of articles about winning customer love. Additionally, our sister-blog, The Digital Impact Blog featured a post on winning customer loyalty via Mobile apps and Fast Company featured a guest blog by Brian Solis "Why User Experience Is Critical To Customer Relationships" that is definitely worth a read for anyone interested in customer experience design. "User experience (UX) is now becoming a critical point in customer engagement in order to compete for attention now and in the future. For without thoughtful UX, consumers meander without direction, reward, or utility. And their attention, and ultimately loyalty, follows." What were your favorite customer loyalty links this week? Customer News of The Week: Customers Are Connected, But Are Your Channels? This week in trend news, The Retail Customer Experience blog picks four top trends to watch out for from video mystery shopping to online review sites. Tablets also continue to invade the in-store customer experience, with brands from high-end cosmetics to casual dining integrating the technology as a self service option. Speaking of the many channels customers now have to communicate, are you using multichannel Customer Management yet? Destination CRM makes a good case for why you should be but a report by Pitney Bowes, "Disconnected Customer Channels" reveals that while "90% of respondents want their communication channels integrated, less than a third, 31% have integrated channels." In social news, 1to1media kept the loyalty conversation afloat, discussing whether ""likes" equal loyalty" (hint, the answer is no but social media ranked the highest (28 percent), over customer analytics, rewards programs, and employee engagement when it comes to engagement). Plus, our NACCMevent twitter account reached it's 1,000th tweet. As we start looking forward to the next Total Customer Experience Leaders (TCEL) Summit in June, we'd like to occasionally share with you some of our favorite resources from around the web on customer experience, customer experience design, and overall customer-centricity. For those in digital customer experience positions, Mashable has started a series supported by Webtrends of posts about online customer experiences. This week offers 7 Ways to Lower Your Website’s Bounce Rate and is worth looking over. Meanwhile, Brian Solis is looking into "Delighting the Highly-Social Customer," particularly noting that "The Customer Experience Happens With or Without Your Preparedness." Grab all the shareable stats on their blog. Like these updates? Follow us on Twitter (where we just passed 200 followers!) or Facebook for industry news throughout the week.